With the holidays upon us and Thanksgiving less than a week away, I’ve decided to share the sides that are a MUST in our house. Ryan is in charge of frying a turkey, smoking another, and the oysters, but I’m in charge of the sides that he feels are mandatory. Begin with a couple large loaves of good, soft, unsliced bread. I use a combo of white and wheat. You’ll need about 9 cups total of bread cubes. Lay them out on a baking sheet and bake at 350 for 10 minutes. Set aside. Sauté over medium heat in 3/4 cup of butter the following: 1.5C diced celery, 3/4C diced onions, and 1C mushrooms (optional) until soft. Now stir in 1/2tsp salt, 1/2tsp sage, 1/2tsp thyme, 1tsp poultry seasoning, and 1/4tsp pepper. 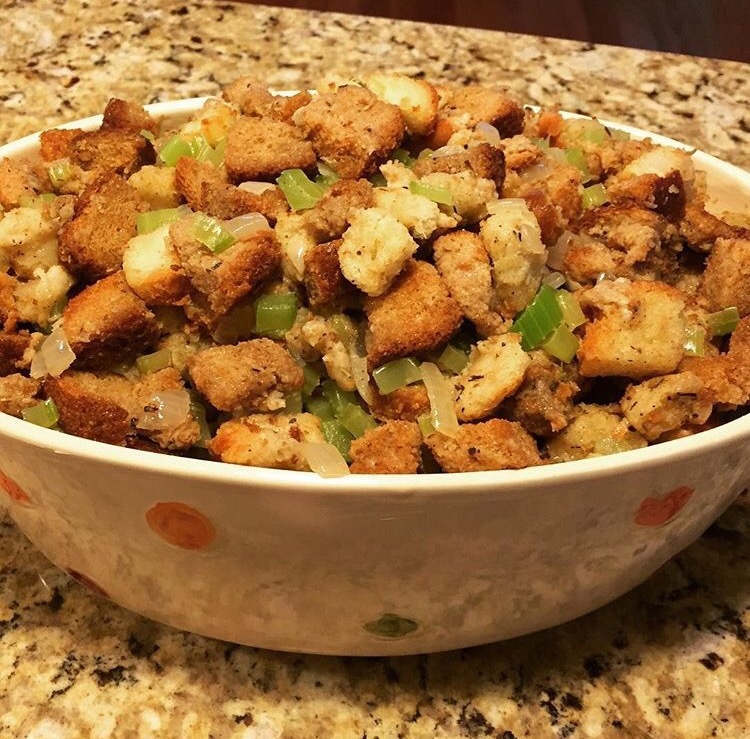 Toss seasoned veggies with bread cubes in large mixing bowl. Add in 1C chicken broth to moisten. Transfer into a greased 9×13 baking dish and bake at 350 (uncovered) for 35-40 minutes. You can thank me later – Enjoy! !